By James L. Swanson and Daniel R. Weinberg. Arena Editions, Santa Fe, 2001. 144 pp., 200 four-color illustrations, 9½x11½". 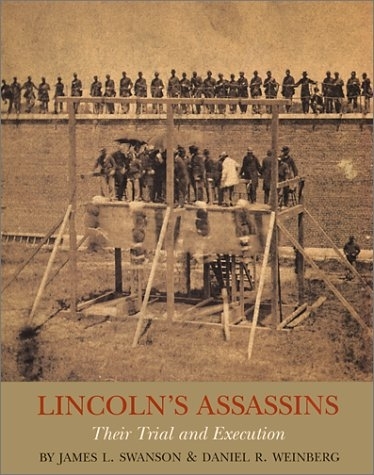 Presenting over 200 contemporary photographs, documents, prints, woodcuts, newspapers, pamphlets, books and artifacts, Lincoln's Assassins seeks to contextualize the events surrounding the trial of the conspirators in the assassination of President Abraham Lincoln, and their eventual execution. The reader is privy to the courtroom drama, peers inside the cells of the accused, reads the opinions of outrage and theories of conspiracy of the day, and ultimately stands witness through a harrowing sequence of photographs of their execution by hanging. Read Publisher's Description.